The recent buzz around Healthy-Not-Nuts Midwest FurFest adventure going viral has me reminisicing about times past. The older I get, the more of these little tidbits of living I hold onto, and the more I want to share them with others. Your the victim today, so smile and nod in all the right places now. Thats a good lad and lass of ya’ll.. In 2012 at Further Confusion, I was walking with seveal friends off to find breakfast. The area surrounding the Convention Center in San Jose is chock-a-block with little bistros, coffeehouses, donut shops, and all sorts of resurants. I was performing in suit this particular morning, and life was just a little sweeter. The sunlight was a little brighter. 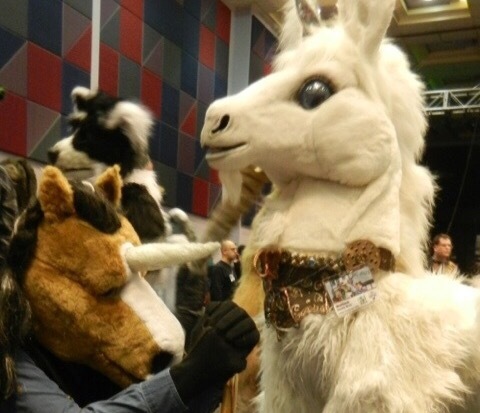 And perhaps one of the most memorable moments of my furry career. Ever since Further Confusion moved into to the Convention Center, they have been booked at the same time as a rather large girls volleyball tournament. There were girls from little prepubescents all the way up to high school aged. They were eveywhere, and almost none were bashful at all. Some where at that age where anything deemed ‘childish’ needs to be mocked, but the furries took it in stride, mainly because we know full well we mock each other as well or better. On the way back, my friends and I, were beset by a group of five girls, the oldest looking about nine. The ring leader of the group wanted a hug, and after a quick glance toward the parents sheparding the childern for a sign of consent, I kneeled down and passed out a few hugs. “Why are you a little girl?” I reposted. Raising my hands in surrender I knew I had no better answer to such a deep question. Sometimes wisdom really does flow from the mouths of babes. Later that day we had the parade to look forward to, and I managed to have one of the most magical (for me) pictures taken. I’ve posted it before, but I’ll repost it below. Sharing the field with so many other wonderful performers. Its been almost four years and even now its some of the best memories I have of suiting.